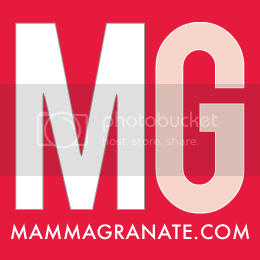 mammagranate: What Should Mamma Bring To The Beach? The less stuff you drag to the beach the less stuff you have to drag back when you and the kiddos are tired. Also it limits the amount of sand that you get all over your stuff. This year we tried to keep it simple when taking stuff to the beach. 1. Sunscreen This Neutrogena sunscreen is awesome because you can apply it directly to wet skin. Spray sunscreen in general is amazing because it is so much easier to apply to a moving child and lets be honest, whose child stand still to get sunscreen on? no ones! 2. Drinks We don't ordinarily buy juice but for vacation we make some special purchases. We let them get a sugary cereal of their choice and we get them juice boxes. I like these ones from Honest Kids because water is the first ingredient which is awesome! When they are out in the hot sun for hours it is so important to keep them well hydrated. 3. 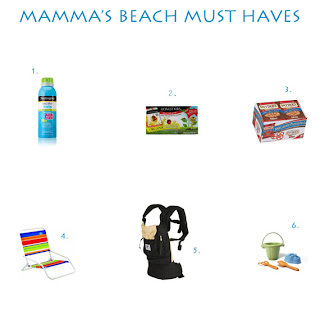 Snacks Any kind of prepackaged snack is great for the beach because you can just toss them in your beach bag. If the kids have sandy or wet hands they will only get it on their own snack. If you rent a place the will unlikely have sandwich baggies and if you are like me you will unlikely think to pack them. 4. Chair for Mom I do not love sand so I like to sit in a chair like this that is close to the ground so you can still help the kids build sand castles. 5. Ergo Will turned five months old on our vacation so he is at a difficult age to take to the beach. I would put him in pajamas with feet and put him in the Ergo with the sun shade covering his head. This way there was no need for sunscreen (most doctors recommend waiting till 6 months). The Ergo is very comfortable and easy to use. William was very happy to sleep there. 6. Sand Toys Don't go crazy over sand toys get each kid a shovel and a bucket and have them be in charge of carrying it to and from the beach. Our kids spent most of their time jumping the waves and digging in the sand with their hands. They barely even used the buckets! You've got that right 'sista! First time holding a baby and definitely first time using the Ergo. But that thing was awesome! If ever I'm lucky enough to have my own child, that is item number one on my "registry!"